Two posts about popsicles, and now potato chips: SOK readers must think all I eat is junk food. I couldn’t resist when I saw these at the supermarket, though, especially the Oregon’s Best brand chips, which are proudly made in the US and come in the traditional American flavors of seaweed and wasabi. There’s a respected tradition of offering chips/crisps in culturally specific flavors, and masala-flavored potato chips aren’t actually all that far off from Indian snacks like Punjabi mix or papadum. Despite the chilis on the package, the chips weren’t particularly hot. I liked the masala spices but noticed a bit of a chemical edge after a bowlful. 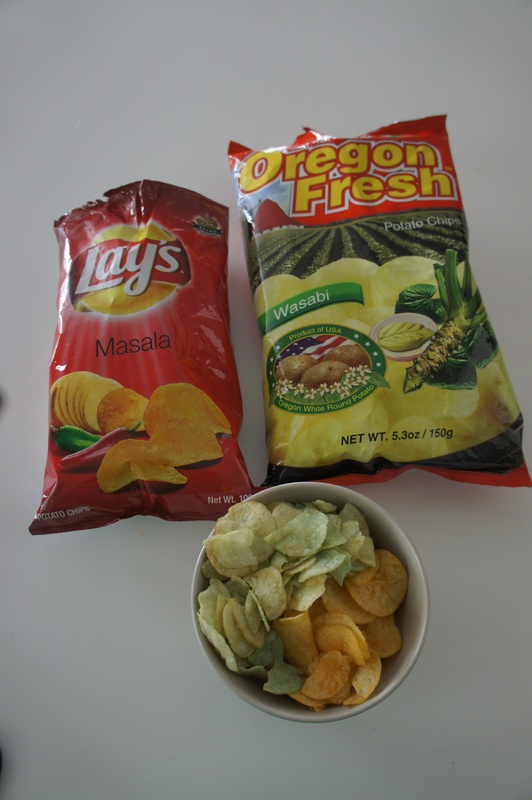 The wasabi chips were a little one-note after the masala, but if you enjoy wasabi peas, you’d probably like these. My first thought was that either flavor, but especially the masala, would be brilliant on a tuna fish sandwich. (Side note: I found out about the potato chip thing reading Then She Found Me, a book which I’m guessing is far better than the movie. We didn’t have potato chips in the house often — they were sort of an exotic foodstuff, like ranch dressing or casserole — but my mom would often put nuts in her tuna salad, adding a pleasant crunch.) Curried tuna salad is totally a thing, and for the wasabi chips, I’d give the tuna an Asian twist, maybe with some sesame or something.